My doctoral thesis was completed at Oxford Brookes University in 2011 under the supervision of Dr (now Professor) Glen O’Hara, Professor Steve King and Dr Alysa Levene, and funded by a generous studentship from the Wellcome Trust. Its focus was on the city of Bristol, examining the British voluntary hospital system in its final decades. It located the voluntary hospitals in their final years – between the end of the First World War and the creation of the National Health Service – within an evolving mixed economy of healthcare and can therefore be understood as an investigation into the response of the voluntary sector to the rise of the welfare state. Two areas of change were examined in particular. The first was planning for health – the voluntary hospitals’ reaction to, and engagement with, the campaign for ‘co-ordination’. This was the ‘reformist’ agenda of the day and its advocates sought to bring about a centralised, technocratic organisation of public services. My thesis went beyond the previously existing literature in two ways. One was by emphasising the local dimension of efforts to bring about the co-ordination of hospital policy, funding and administration. The other was in the assertion that the voluntary sector was actively engaged in this movement – not only a subject of reform, but also an agent of change. The other area of change considered was that of access and entitlement, or paying for health. 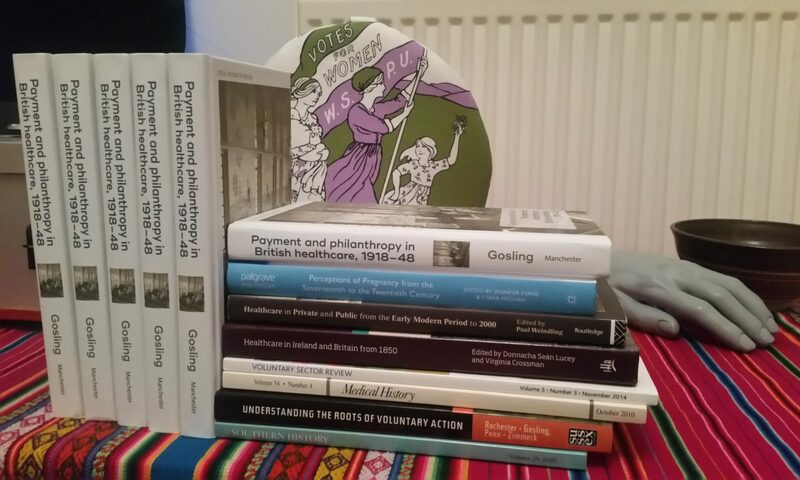 It is this aspect of the thesis that forms the basis for the monograph – Payment and Philanthropy in British Healthcare, 1918-48 – which will be published in the Social Histories of Medicine series by Manchester University Press. This was a period that saw the abandonment of old philanthropic means of gaining admission in place of medical admission and a variety of payment schemes. These included the means-tested system of the Lady Almoner (later renamed the medical social worker), the pseudo-insurance hospital contributory schemes and the expansion of private wards operating on a commercial basis. It was argued that the existing literature has overstated such changes, emphasising instead the continuity of a system that remained fundamentally philanthropic. The scale of exemptions from and reductions to patient payments granted by the almoner as well the limitations of private provision was discussed in making this case. Ultimately, my thesis argued, the voluntary hospital system was neither left behind by the reforms of the day nor reformed beyond recognition by the time of nationalisation in 1948.